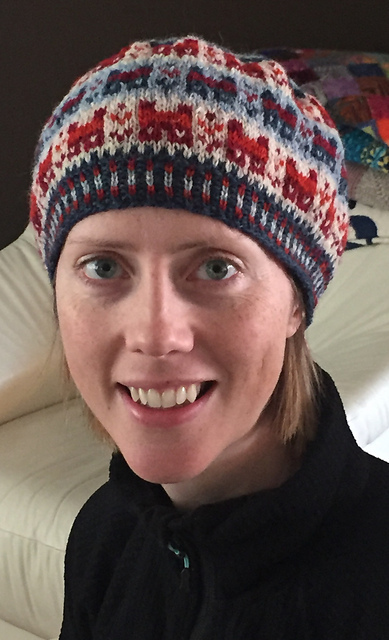 And here is the second Crofthoose Hat. For the wool, this time, I moved over to Jamieson's, the other wool company in the Shetlands. Even though the names are close, Jamieson & Smith and Jamieson's are not the same company. It's a coincidence that they are so similar, and I'm sure that it confusing to some. I was for me for quite a while. I'm just thrilled that there are two companies with wool that is interchangeable - so many color choices. 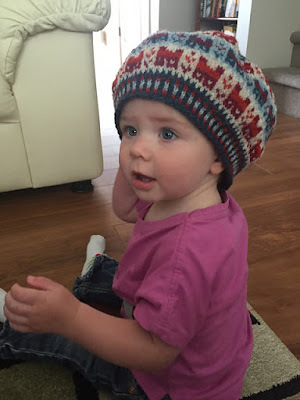 The hat is being modelled, this time, by my daughter, Jessica, and my 10-month-old granddaughter, Alyssa. Yarn: All Jamieson's Shetland Spindrift. Someone on Ravelry knit the hat in a colorway that appealed to me, so I copied her choices, except for one. She had a very bright Fuschia in the mix and I changed to a slightly more subtle Ginger. I stuck to using five colors as in the pattern.